16 years of running this ride and with the considerable help of friends and relatives we had another great day. Although foggy and cold during Registration, the sun came through and we were treated to some great winter riding conditions, with virtually no wind. Only one reported fall when a rider touched another wheel, where have I heard that before ? Nothing too serious though, but a loss of some skin an no doubt some bruises. Although not a race I think it is interesting to learn how fast some folk are. Quickest time in the 70km was just over 1h. 41 min. with a leading group of 4 nearly being caught on the line by a large group which included the 1st females home just 20seconds back. Also in the group a young Tauranga rider, 13 year old James Johnson. The future looks good for cycling when we have young folk showing such good speed. For most of us it was about the ride not the time, and judging by the mostly smiling faces everyone had a great day out. Thanks to our sponsors on the day, Giant Bikes NZ, Hedgehog Bikes of Tauranga, offering some great deals, and Hammer Nutrition, with their sports supplements, drinks etc. Thank you all for riding, We do hope you enjoyed the day, please come back next year Sunday, 26th July . Why not make a weekend of it and stay at the Okoroire Hotel? Our 15th running of this ride, and what a day. Starting and finishing at the Okoroire Hot Springs Hotel we had perfect weather, calm, no frost, and dry roads, I think the best conditions we have ever had. Well over 600 riders had a great day, with the conditions contributing to a lot of Personal Best Times. The 70km (actually closer to 68km) was completed by the lead rider in 1hour, 37min (10 minutes faster than last year’s record time) with the first female home 1hour 49min. There were no reported crashes, although the St Johns did attend to a rider who fainted and fell from his bike, he was all OK and was later seen back at the “Pub”. The Marshalls reported that rider behavior was good, however a few did allow their competitive spirit to affect how they interact with some of the motorists. The behavior of the traffic was also pretty good. I think this is helped by our Marshalls, and having plenty of warning signs, many additional to that required by our Traffic Management plan. I did learn of a few riders who ignored, or did not see 4 large Left Turn signs, plus half a can of spray painted arrows on the road. This was on the 70km ride, just after passing through Arapuni (The left turn into Darby Rd). Remember it for next year. The 40km (closer to 36km) riders also rode well with a couple of juniors finishing in front. Ride time for them 1hour 05min. and the lead female in 1hour 06min. It was noticed that not all 40km riders played by the rules and started instead with the 70km group, to try and gain an advantage. We start the groups separately, for safety reasons, so if you want to ride the 40km you should start with the 40km riders. However, for most, this ride is not about racing, it is a chance to ride some really nice Waikato country roads, with friends and with and with the support of other riders. Neither the 70km or the 40km ride are considered difficult, and they continually attract many riders who are new to our sport. The Okoroire Pub helps create a great atmosphere, whilst having the support of the Tauranga, Mt Maunganui and Rotorua AVANTI Plus shops really helps. If you have never done this ride it should go on your “Must Do ” list. What a great day, the new options on the ride proved very popular, allowing riders of ALL abilities to really enjoy the day. Distances varied from 28km to 34km or the full ride 44.5km. The long loop is for experienced riders only. An all weather surface, a couple of climbs, but rideable by most, great flowing downhills, a couple of shallow stream crossings, and a ride alongside Lake Pearson. FANTASTIC . All of this and the spectacular scenery of the High Country, what more could we ask for? This ride, through privately owned Flock Hill Station, is the only opportunity for mountain bikers to experience the stunning and varied terrain without being a guest of Flock Hill’s lodge. Striking rock formations, craggy hills, pristine rivers and wide open spaces make up this 14,000 hectare working station – film set for The Lion, the Witch and the Wardrobe. Fast experienced riders can expect to complete the ride in two hours, reasonably fit recreational cyclists in three and a half, and totally social meanderers and scenery soakers about 4 hours. After the ride there will be a “High Country BBQ” organised by the station, with proceeds to the local school. Near the BBQ will be a bar for those needing to quench a thirst. When is the next ride at Flock Hill? Registration from 7:30am; Riders Briefing 9:45am. Spot prizes will be drawn at 2.15pm. Flock Hill Station on SH73 (the road over Arthurs Pass,) about 90 minutes drive from Christchurch. What a great day we had this year, we couldn’t have wished for better weather. Everyone was smiling, and I am sure that the new track contributed to this. As most of you will know in 2008 and 2009 we ran the ride around “Broken Hill” using SH 73 at the start so as to access the Stations tracks. Late in 2009 the Station owners had a new track cut, mainly for moving stock, but also for us to use, so avoiding the main highway, and riding in the reverse direction to give us even better views. Unfortunately the new track proved to be too steep, and with down hills that were potentially dangerous. The Friday before this year ride was spent frantically checking out the Stations trails for a suitable course. WOW! what we found is fantastic. An all weather surface, a couple of climbs, but rideable by most, great flowing downhills, a couple of shallow stream crossings, and a ride alongside Lake Pearson. FANTASTIC All of this and the spectacular scenery of the High Country, what more could we ask for. This is a great recreational ride, with enough variation so that even those fast riders who were first home enjoyed the day. Next year we will introduce an optional 4km loop, to be ridden on the way home. So spread the word, it is much more rider friendly than the 2008 and 2009 trails. Thank you all for supporting the Flock Hill ride and I look forward to seeing you all again next year. Four inches of rain in the proceeding 36 hours certainly changed the trail conditions. We were very lucky that it cleared up for Registration and of course the ride. There was a time when I wondered if our Tail End Charlie would have to use a Quad bike as opposed to his 4×4 ute, but it all worked out OK. Despite there being quite a lot of slippery clay in places, ride times were very similar to the previous year’s dry conditions. I must say that most crossed the finish line with smiles on their faces, although some had a look of relief. As expected the trails proved to be useable and safe even in the adverse conditions and the streams did not cause any concern either, just wet feet. The hose for the bike / rider wash was in strong demand, and some had to wait for the pump to catch up. Feedback from riders, both novice and experienced, has been great, with all acknowledging that dry conditions would have been preferable, but the ride was still enjoyable. Once again the really fast riders were back within 2 hours whilst the majority had a relaxed ride, all finishing within 5 hours to be present at prize giving. Ground Effects had staff riding, as well as donating some great clothing as prizes. Cycle Surgery had support mechanics on the course, who as well as enjoying themselves on the Quad bikes also donated prizes of Otago Rail Trail Rides including accommodation, shuttle, food, bike hire etc. New Zealand Multisport and Triathlete – May 2008. The day before we were due to ride 32 kilometres through alpine country near Arthur’s Pass we woke to find our bike seats decimated. Kea! That would have been a good excuse to chill out and enjoy the spectacular scenery instead. But no, the boys from Dunedin’s Cycle Surgery were on their way up with plenty of spare gear, seats included. 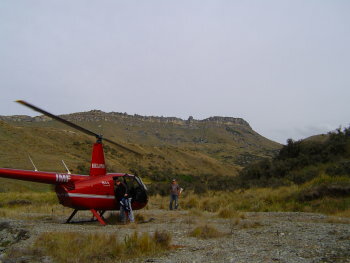 That sorted, partner Mark and l were invited to join ride organizer, Cliff Kingston, on a helicopter flight to ensure the track was clearly marked and to add directional signs at ambiguous intersections. We were piloted by another Mark, Mark Fraundorfer, one of the two businessmen who own and love this high country station. He had flown in for the event. Flock Hill Station is about an hour and a half from Christchurch on the main Arthur’s Pass highway, an easy drive that delivers you across the plains and suddenly into the ranges and past the turnoffs to Broken River and Craigieburn ski fields. As well as 14,000 hectares of working station, Flock HilI has comfortable motel accommodation, a backpackers lodge, a conference facility and big relaxed restaurant. Camping was also provided for this weekend making it an ideal venue to welcome some 280 riders for the inaugural Flock Hill Adventure Hide. The helicopter ride made the track look relatively easy. After the third landing we left our pilot to fly back and walked a few kilometres down the final lap we’d be riding the next day. That afternoon the organisers and various helpers who would not ride on the day did a test ride. They all came in smiling. Next morning bike toting cars streamed in from 7am. Registration went smoothly before everyone gathered by the woolshed for the briefing, during which Cliff pointed out a few potential pit falls, and reminded riders that this is serious high country. If injured help would arrive but not instantly. He stressed it was a ride not a race. So we took our time leaving, so those hard-outs who ignored that ‘no race’ message could take off. The ride started through tracks and across a muddy stream where a boulder awaited just underwater to dump those who’d missed the warning: then across paddocks cleared of merinos and out to the main road near the beautiful Lake Pearson. The six kilometres of seal started with a flat cruise back past the station entrance then a very steep climb rewarded with a fast run to the turn into the ‘movie road’, a track upgraded when Flock Hill was a location for the making of The Lion the Witch, and the Wardrobe. Dramatic craggy rocks formed a cinematic skyline above us. The partner puffed up behind me. ‘I didn’t see you pass me,’ he gasped. ‘That switchback was hard work.’ I’d noticed it the day before and simply missed it by pushing my bike straight up the paddock! From then on the first half, deemed the hardest, was a series of tough ups where even the fittest conceded defeat to the incline, but well worth the trade off – huge down hills where the speed at which I was passed clearly showed the more experienced riders were loving it. The top of one long hard push became the place to stop for a snack and to soak up the views of what was on this February day an arid but breathtaking alpine landscape. The four-wheel-drive tracks of a hilly section gradually eased, the ups and down became less pronounced, and the winding tracks stretched out through the valley as the circuit headed back to the station headquarters. But l was on automatic pilot by then. An argument with a very rocky corner rammed my handlebar through my left breast till it met resistance – ribs. But I’m a brave girl so l assured the doctor stationed half way on a quad bike that l was fine and continued on the second ‘easier’ half. It may have been a breeze had the wind not decided to bellow in straight at us. The last straight down to the woolshed was a deceptive couple of kilometres that seemed to take forever but we made it in a very respectable 3 hours 40 minutes. The fastest rider took two hours. The slowest waved away the ambulance with a rude gesture as she struggled in six hours after start time. A high country barbeque on the lawn was a great way to relive the highs and lows. Most agreed it had been harder than they expected but they would do it again. About 40% were women, many appreciating the non-competitive atmosphere. Feedback since has confirmed to the organisers that, yes, it was challenging, more so than the Motutapu apparently, but most say they will return and bring their friends. So diary next year – Saturday February 21 2009 (www.funcycling.net) – to ride the spectacular high country in very convivial company. Just put your bikes under cover if staying overnight. No doubt the kea have booked too! 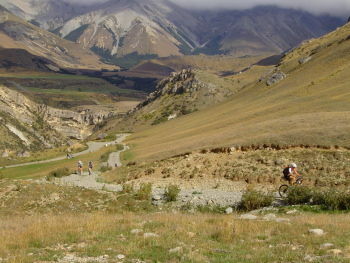 New Zealand Endurance – June 2008. 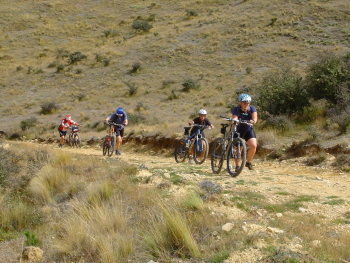 The inaugural Flock Hill Adventure Mountain Bike Ride circled 32km of high country at Flock Hill Station. 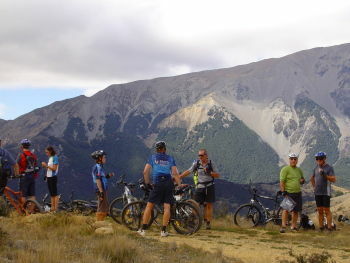 Situated 40km east of Arthur’s Pass and 90 minutes from Christchurch the station is close enough to civilization to be an ideal venue for a MTB ride. Ideal country too, we soon found out, though not for the unfit or the fainthearted. Flock Hill Station is 14,000 hectares of working sheep, cattle and deer country bounded by the Craigieburn and Torlese Ranges and the Waimakariri River to the north. The scenery is absolutely stunning; with rolling pasture, and arid hills giving way to the huge crags that were the set for the movie, The Chronicles of Narnia: The Lion, The Witch and The Wardrobe. Numerous activities available on the station include some excellent bouldering, hiking and 4WD opportunities. The station provides accommodation for backpackers and also has comfortable motels. There is a great restaurant and bar onsite as well. We awoke the day before the ride to find that kea had trashed our bike seats. Nobody warned us not to leave them on top of our car. A quick call to the guys at Cycle Surgery and some replacements were on the way. A big thank you to Dave and the rest of the Cycle Surgery crew, who also spent the weekend assisting competitors, providing free bike checks and sponsoring heaps of spot prizes. As we couldn’t go for a practice ride, the day was spent helping Cliff Kingston, the organiser, set up the ‘portaloos’ and put out signs. Mark Fraundorfer, one of the station owners, offered to ferry us around the course in his helicopter – way to go! The views from the air were even more spectacular than on the ground. The only downside being that having seen the terrain, I wasn’t so sure about doing the ride – those hills looked long and very steep. By evening, those making a weekend of it had arrived and set up camp. A festive atmosphere prevailed in the bar, tempered slightly by tomorrow’s prospect. A short steep downhill strewn with rocks led to another stream crossing. Most chose to get off and walk across, some rode straight through and a few got a serious dunking. A longish uphill with a huge switchback followed. The views here were stunning – out across to the Torlese Range to the East and up to the bouldering crags to the North. Some paddocks to cross, a tricky sidle around some narrow single track and down a steep bit of clay and tussock linked the next stream. The next uphill was short but extremely steep. An easier pedal across a small plateau completed this section. A short drop off took us to yet another stream crossing before a serious hill, which seemed to go on forever – now I know why they call them pushbikes! A fast windy downhill with plenty of loose rocks caused a few scary moments. What’s this? Another hill? Definitely time for a drink and a snack at the top of this one. The next downhill was pretty gnarly with big rocks and loose scree. Some even chose to get off and walk down. Those of us on hardtails really struggled on these rocky downhill sections. I can now see the value in a good full suspension bike. A drink and first aid checkpoint at the bottom gave an excuse for a stop and chat with the mid point First Alder (Bob – a Doctor visiting from the USA) One of the women had a tangle on the way down and had poked a handlebar into her upper ribs. ‘Lift your top and let me have a look’, says Bob, ‘I really don’t mind’. Shameless! The early riders had an easy ride home from here, but the slower ones were caught by the nor’wester, which seemed to be gaining intensity by the minute. The last 8km straight into a near gale headwind was particularly soul destroying. Te fastest riders completed the circuit in just over two hours. The slowest came in just over six. 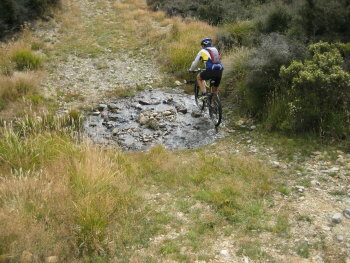 Virtually all had to push on at least one section and some of us did quite a bit of ‘push biking’. It was great to see so many female riders and family groups on the ride. This is something often lacking at the male dominated ‘hard out’ races. It is worth noting that the third rider home (in just over two hours) was a female competitor – she certainly showed up plenty of blokes. A number of riders had damage to derailleurs and chains due to the rocks on the track. Not to mention a few bruised and battered bodies. The high country barbeque and liquid refreshments after the ride were very welcome, time to sit in the sun, chill out and compare stories about the ride. Like the one about the guy who had seven punctures. He was borrowing tubes from fellow riders and even broke his pump it had so much use. When the Cycle Surgery guys found out they pointed out the need for lots of air pressure to counter the fast rocky down hills. This would have avoided shearing off all those valve stems! With a couple of new tyres and some free tubes courtesy of Cycle Surgery he was able to ride the Craigieburn loop the next day. This was a great ride made all the more exceptional by the family atmosphere, stunning location and non-competitive aspect. Feedback from participants suggests that it was more challenging than they expected, but not enough to put them off coming back next time. Next year’s ride promises to be even better, as organiser Cliff fine-tunes the event, and the word gets out to the rest of the mountain bike fraternity. 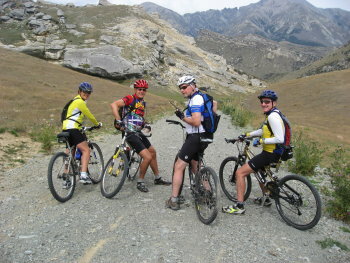 Maybe we could do a return trip next year to do the Flock Hill Ride, the Otago Rail Trail and then the Mototapu? It’s hell living in MTB paradise! The next ride will be held on February 21, 2009. Entry forms will be available from your local bike or outdoors store closer to the time. Also check out wvw.funcycling.net for more information. I think we were very lucky with the weather, despite the head wind at the end did making things a bit tough. 290 riders of whom 120 were women 170 men, absolutely fantastic, and every one finished. The first rider rode in at 12 noon, just 2 hours of riding, the first lady about 3mins later, the last was around 3.30pm. I know it was not a race but it is interesting to know how fit some people are. I rode the course ( except for the steep uphills, which I walked ) on the Friday in 3 hours and my wife, who also walked some of the down hills took four and a half hours. To my knowledge the only falls on the ride were relatively minor, with scrapes to the knees and elbows the most common result. Thank you for riding sensibly and keeping safe. The riders who I have have spoken with say they enjoyed the ride, excellent, and I hope everyone else who rode also enjoyed the event and I look forward to seeing you all again next year. I have received some constructive feed back, much of which echoed my own thoughts. By learning more about my computer and by having Flock Hill’s land line phone number available as an alternative to my cell phone. We will clear the overgrowth from the first 500m of track so that the start can flow more easily. We will have some progress signs made, so that you have some idea of how far you have to go, i.e. quarter distance, half distance etc. We will have signs on the gates to advise people to leave them open, one well meaning station hand closed a couple of them, this was only a problem for a couple of the faster riders. We will have some one stationed at the gate to take names of those leaving early, so that we do not waste time at prize giving calling out names of those folk who have had to leave. Thank you Lee, I found this most interesting. If anyone else has comments about the ride, please contact me.